Osamushi (筬虫) is the Japanese generic name of ground beetles, is a large cosmopolitan family of beetles, classified in the order: Coleopteta, suborder: Adephaga (Geadephaga), family: Carabidae; specifies the relatively large beetles, carnivorous, mainly lives on land. Most of those have beautiful body color. “Osa (筬)” in the Japanese name is originated to reed also called Osa (筬), a device in a loom machine that weaves the warp and weft threads to make a piece of cloth. In classic hand loom machines, there is a different type of Osa combined with Hi (杼) a shuttle in spindle shape, that enables to carry the weft thread between the upper and lower warp threads. Osamushi’s shape with a tapered head was likened to Osa, and has weaved the name. Moreover, without exception, ground beetles do not have the ability of flight. The reason why their elytra (hardened forewings) are tapered toward the heads is they had degenerated their flight muscles, as is common throughout non-flying beetles. Exceptionally, Katabiro-osamushi (肩広筬虫, Campalita chinense) has the flight ability with square-shouldered forewings, as “Katabiro (肩広)” in the Japanese name means wide shoulders expressing well. A well known episode about Osamushi, a Japanese cartoonist Osamu Tezuka (手塚治虫, real name is 手塚治) known that he was a bug lover since his childhood, strongly wished to have his pen name as 手塚治虫 to be pronounced Tezuka Osamushi, yet was disapproved by the editors and readers insisted that would cause a confusion and sound strange if he would be called Tezuka Osamushi-shi (手塚治虫氏, “氏” = -shi is used as Mr. or Ms.), therefore decided to be 手塚治虫 pronounced Tezuka Osamu. 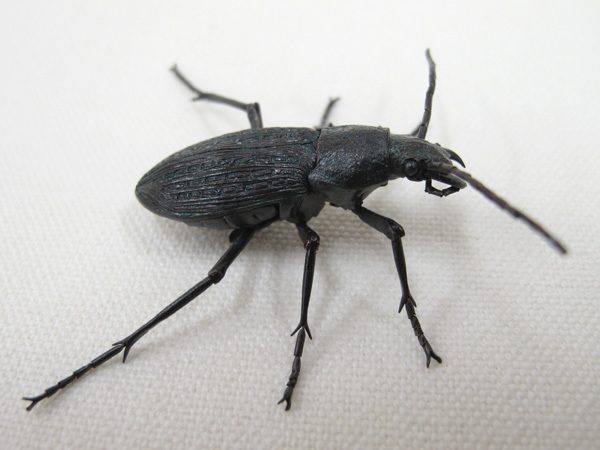 Incidentally, in that time he had an Ao-osamushi (Carabus insulicola Chaudoir), is the most common ground beetle in Kantoh area (関東, around Tokyo), but rare in Kansai area (関西, around Osaka) in Japan. Osamushi(es) inhabit the slopes where able to get sufficient sunlight; in winter, spend the time in imago and stop activities and stay underground in a group of the same species, though they act independently from spring to summer, i.e. in their active seasons. While hibernating they emit the smell of musk, therefore once Osamushi collectors scent it is worth rounding up the whole group. For the protection, they had sealed the flight ability into the armor (elytra) that is spontaneously polished irrelevant to their will, but hardened as their caution against the enemies. They do not have difficultly with hunting their preys in speed, despite that are agile far beyond they need as if complementing the lost flight ability. Even though they are insanitary for human and having the unpleasant odor, they are surely fascinating in many reasons, thereby called “the walking gems” among insect lovers. Recently, some foreign species called “Predator Beetle” have started to appear on the market. This piece has the joints, tentacles and mandibles (jaw) all movable, is same as the other work of Maimai-kaburi (Damaster blaptoides) which is also classified as a ground beetle. The color had been painted in metallic-green –the representative color of Ao-osamushi- on the surface blackened through sulfuration. In this work, I had pursued in its position especially when it is simply put on the ground, and now think that is well expressing the real pose. Copyright 2008 HARUO Mitsuta. All Rights Reserved.